Productive individuals are consequences of productive teachers. Fact: Public elementary and highschool education in the country are facing challenges. Philippine education is far from fine. 47,000 public elementary and highschools, a meager government budget, a thankless teaching salary and classrooms without walls. Coalition for Better Education dropped a lot of reality-check-bombs during the Blogger's Forum hosted by Philippine Information Agency. From left: CBE President Jeffery Tarayao, CBE Executive Director Marilou Flores and PIA Cebu Information Center Manager Rachelle Nessia. While sitting down trying to drink in all the introductions it struck me hard that I am clueless. Education issues I only hear about in the news are one by one becoming vivid and real to me as we got served with the hard facts from mouths of the people who have seen - firsthand the state of our education system. I cringe, because in my own bubble, education is fine. I was, for a long time, under the impression that once you get in school you immediately get served your buffet of ABC's and 123's. When you digest them well, these are all you need to make good in life. The issues keep coming but so are the many ways to lift things up for better education. Although our teacher's salaries and education budget are how much the government says they are, groups such as the Coalition for Better Education materialized to be education's other set of arms to hold on to for strength. Since 2001 CBE has gathered education stakeholders, unite other groups, individuals and companies to take part in thrusting for better education in the Philippines. Their vision is to CREATE EMPOWERED LEARNING COMMUNITIES. They believe, and I agree, that education is a shared responsibility. We cannot solely blame the government for poor education. Everybody has to have a hand to lend. During the Blogger's Forum, CBE introduced to us modules on Project Based Learning Energy Flashcards and Do Energy Flashcards. This is developing teaching tool that is K12 ready which innovates the standard way of learning. Personally, I find the method very interesting and engaging. We all learn in different ways, and I think Energy Flashcards have something to offer for all types of learners. Imagine giving this resource to our teachers, it is going to change things for the better. CBE empowers our teachers, our main educators to produce better ways of teaching. They get introduced to teaching tools and methods that are attuned with the demands of the present and flexible for what lies ahead in the future. For the why's and how's of joining CBE go HERE. 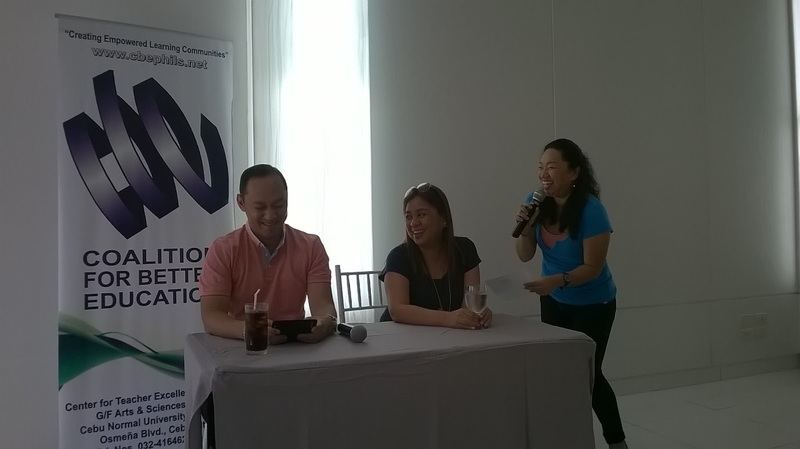 Cebu Blogging Community is One!